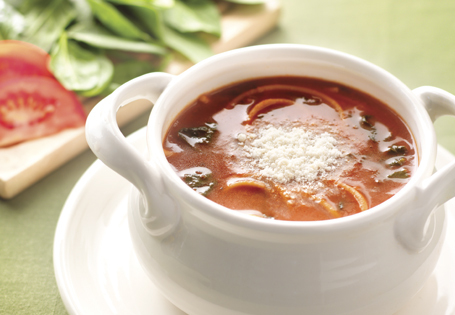 A hearty and healthy soup. In a large saucepan, combine pasta sauce and chicken broth. Bring to a boil and reduce to a simmer. Add oregano, black pepper and salt and continue to cook for 5 minutes. Add spaghetti and cook for 8 minutes. Stir in spinach and parmesan cheese, continue cooking until spinach is wilted, about 2 minutes. Top with additional parmesan cheese, if desired.